In the Introduction it says, "Being happy is relative". So is humor. 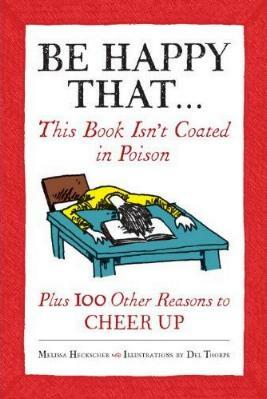 You could look at the funny side of being happy because "Be happy that...blinking doesn't change the channel" or "Be happy that...you're not a bulletproof vest tester", but quite honestly, I didn't raise much more than a meek smirk throughout the entire book. All reasons to be happy are accompanied by an illustration, none of which are particularly humorous. The only one I thought vaguely funny was "Be happy that...microscopic things stay microscopic". The book does suggest that one has to perhaps lower one's expectations of happiness, but I don't agree totally. I'd rather laugh at something cleverly humorous, not the ridiculous. I pride myself on having a good sense of humor—I laugh at the inane, the outrageous, the bizarre, and the clever—I love it all, except ridiculously lame excuses for humor. For example, "Be happy that...automatic weapons don't spontaneously appear in your bags whenever you go through a metal detector" or "Be happy that...your cell-phone ringer isn't set to "electric shock"". I suppose it's a case of "one man's idea of humor is another's idea of idiocy".